The Despotic Feasts were established by the Church to be celebrated within the year for us to remember the great events that took place with the Incarnation, the Passion and the Resurrection of Christ, but especially, and above all, to experience the mystery of Christ and the mystery of our regeneration. This is the reason why the celebration of these events are preceded by a period repentance, fasting and prayer, and all are linked with the Divine Liturgy and the Communion of the Body and Blood of Christ, which means our own existential participation in these great and wonderful events. In regards to the feasts of the Passion and Resurrection of Christ, the central points of the celebration are horrible Goglotha and the life-giving Tomb of Christ, which are located in Jerusalem, and are the center of our love and worship towards the suffering and risen Christ. Golgotha is associated with the Cross of Christ and His Tomb with His holy Resurrection. On the occasion of the celebration of the Resurrection of Christ we will now need to turn our attention to Christ's Tomb, the empty memorial, in which was placed the glorious Body of Christ, after His death on the Cross and being unnailed from it. 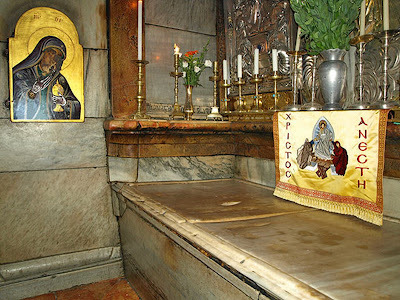 The Tomb of Christ is a historical site, above which the piety of Saint Constantine and Saint Helen founded the Church of the Resurrection, but it was also the center of love and reverence for the early and later Christians. Billions of Christians throughout the ages have placed there their love and their reverence and have been helped in the course of their lives, as well as being spiritually reborn. It is, therefore, a historical event, but it is also a mystery. The hymns of the Church speak of the value of the Tomb of Christ, in as much as it was the special place in which the Body of Christ was entombed after His unnailing from the Cross, and in so far as the mystery is associated with it. In one hymn from the Canon of Great Saturday it is written: "the Tomb and the winding-sheet reveal your deepest mystery, O Word" (Ode 5, Eirmos 2). The Tomb received the Body of Christ with His Divinity, and shows that death cannot hold Christ. We Christians believe in the mystery of the Cross and the Resurrection of Christ. In another hymn of the same Canon is chanted the following: "O blessed Tomb that sheltered the sleep of the Creator! You have become the divine treasure of life; this was done for our salvation, and we praise Him: Blessed are you, O Lord, for you redeemed us" (Ode 7, Eirmos 2). That is, the Tomb of Christ has become "blessed" because the Creator was contained within as if He was sleeping. Although the Body of Christ died on the Cross, because of His Divinity death was like sleep, "life-breathing sleep", which gives life. So this Tomb has become a divine treasure of life and contributes to the salvation of we who praise the Risen Redeemer Christ. The Tomb of Christ is praised in another hymn as life-giving and more beautiful than Paradise. It says: "How life-giving, how more beautiful than paradise, and truly more resplendent than any royal palace is Your Tomb, the source of our resurrection, O Christ." The physical Tomb of Christ is in Jerusalem which was indicated and established by the historic Church and the love of Christians. At the same time, however, the Eucharistic tomb is the Holy Altar, on which is performed the bloodless mystagogy, and from where is proclaimed to the whole world the mystery of the Cross and the Resurrection of Christ, which regenerates all who approach Him, with Orthodox presuppositions, and desire to taste the Body and Blood of Christ. The mystery of the Tomb and Resurrection of Christ is lived by those who are regenerated by the Holy Mysteries, especiall the central Mystery which is the Divine Eucharist. Saint Maximus the Confessor gives another interpretation of the mystery of the Tomb which shows the Resurrection of Christ. He writes: "The cosmos is a despotic tomb which is also in the hearts of all the faithful." The cosmos is a despotic tomb, because in it exists the logoi of beings, the uncreated energies of God; moreover the heart of man is a despotic tomb because there Christ rests and rises in human existence. For this reason, as he continues to say, they will see Him "risen in glory", while for others who don't have Him entombed within themselves Christ will be "invisible". These days we are always honoring and reverencing the Tomb of Christ in Jerusalem, which shows the mystery of the Cross and Resurrection of Christ, but we are also linked with the Holy Altar, the empty memorial, and we strive to offer our heart to Christ in order to make it a despotic tomb. This is how the saints lived throughout the centuries and this was revealed by the Apostles, Martyrs, Confessors, Fathers, Venerable Ones, and Ascetics who sacrificed their entire lives for the Risen Christ. They did not do this because they studied historical events, but they were inspired by the experience of the mystery of the Cross and Resurrection of Christ. Let us pray that the Risen Christ reveal to us constantly the mystery of the life of salvation and let us hear Him proclaim the mystery of His Resurrection which will gladden our existence. Let us always be linked to the Tomb of Christ which is the Holy Altar. The life and voice of the Risen Christ can eclipse and neutralize all human voices of dead intellectuals who question the greatest event in history, the Resurrection of Christ. Source: Paremvasi, "Ο Τάφος του Χριστού", March 2007. Translated by John Sanidopoulos.